E.ON is looking to compete with third-party vendors like Sonnen and Tesla. Germany’s second-largest energy company, E.ON, is planning to launch a residential PV-plus-storage offering for the German market in April, the company has confirmed. The product will be based on Solarwatt’s MyReserve battery systems, which went on sale last year. E.ON has not confirmed pricing for the product, but MyReserve is being sold in Germany for between €7,000 and €9,000 (USD $7,600 and $9,780), depending on the size of the solar panels purchased. The price includes the PV panel, battery, inverter, electronics and sales tax. 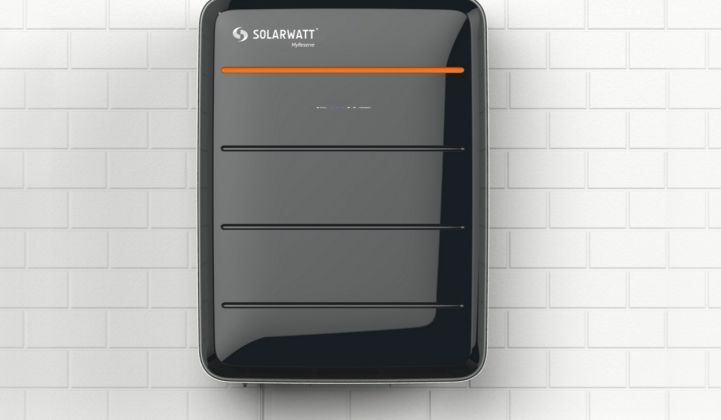 Solarwatt is also selling battery systems on its own, with prices starting at €5,500 (USD $5,975), including sales tax, for a 4.4-kilowatt-hour unit. The battery can be scaled up to 11 kilowatt-hours, comes with a 10-year warranty, has a 100 percent depth-of-discharge, and 93 percent round-trip efficiency, according to Solarwatt’s specification sheet. Solarwatt has confirmed its pricing was based on a proprietary Boston Consulting Group study that cited €1,000 (USD $1,085) as being the tipping point for consumer battery adoption. “We are at that level,” said Carsten Bovenschen, managing partner at Solarwatt. The battery can last for up to 12 years with daily cycling. In practice, the lifespan is likely to be more than 15 years since almost all PV production is consumed at the source rather than being stored during the German winter, Bovenschen said. Along with partnering with E.ON, Solarwatt is selling MyReserve systems through a network of around 100 solar distributors. Solarwatt has partnerships with other major brands, such as Bosch. The solar-and-battery system, which is aimed at both the residential and small-to-medium-sized enterprise sectors, is based on lithium-ion battery technology. Neither E.ON nor Solarwatt have confirmed the name of the battery maker that will be involved, although sources tell GTM it is Samsung SDI. E.ON unveiled a strategic partnership with Samsung SDI in December and the two companies have been collaborating on microgrid technology since March 2015. However, that relationship is not exclusive. E.ON's Russo also cited LG Chem as a potential battery storage partner. “We want to focus attention on the chemistries that best fit the applications we are looking at." The utility's growing interest in storage comes as it prepares for a tripling of renewable energy generation across its key markets in the next 15 years, said Russo. In addition, E.ON’s consumer business in Germany is increasingly under threat from challenger brands such as Sonnen, which are making it easier for customers to cut electricity bills by producing and storing their own solar energy. E.ON signaled its intention to fight back in December when it became a strategic investor in Greensmith, a U.S. leader in energy storage software. “E.ON is committed to empowering customers and promoting decentralized energy solutions while expanding our power grids and making them smarter," said Susana Quintana-Plaza, senior vice president of technology and innovation, in a press release. With the first units of Tesla’s Powerwall home energy storage product now being shipped to Germany, Russo hinted that E.ON’s entry into the residential battery market will be a similar, sleekly designed consumer offering. E.ON is developing storage products for commercial and industrial customers, along with residential. The company is also active in the utility-scale storage market, with a 10-megawatt, 2.5-megawatt-hour battery system under development for ancillary services with Tucson Electric Power in Arizona. In Germany, it is a partner in M5BAT, a government-funded project to create a modular multi-megawatt, multi-technology, medium-voltage battery storage system at RWTH Aachen University. E.ON has also been shortlisted for a tender of up to 250 megawatts of storage to provide frequency response services for National Grid in the U.K.